Ginseng is a slow growing perennial plant with fleshy roots. It is comprised of eleven species belonging to the genus Panax of the family Araliaceae. A perennial plant grows and blooms during the spring and summer season and then dies back each autumn and winter. It returns the next spring from its root stock. 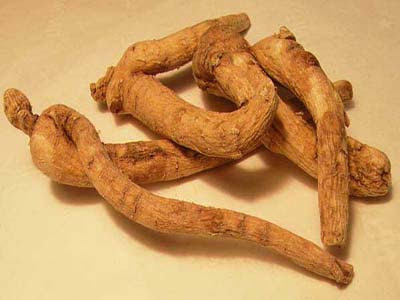 Ginseng can only be found in the Northern Hemisphere, North America, and in eastern Asia (mostly in Korea, North-Eastern China (Manchuria), and in Eastern Siberia). The herb is characterized by the presence of ginsenosides. Ginsenosides are a class of steroid glycosides, and triterpene saponins. They are also known as panaxosides. They are found exclusively in ginseng and are studied extensively as these are believed to be the active compounds behind the claims of ginseng's efficacy. High doses of the herb American ginseng (Panax quinquefolius) over two months reduced cancer-related fatigue in patients more effectively than a placebo, a Mayo Clinic-led study found. Sixty percent of patients studied had breast cancer. The findings are being presented at the American Society of Clinical Oncology's annual meeting. Researchers studied 340 patients who had completed cancer treatment or were being treated for cancer at one of 40 community medical centers. Each day, participants received a placebo or 2,000 milligrams of ginseng administered in capsules containing pure, ground American ginseng root. "Off-the-shelf ginseng is sometimes processed using ethanol, which can give it estrogen-like properties that may be harmful to breast cancer patients," says researcher Debra Barton, Ph.D., of the Mayo Clinic Cancer Center. At four weeks, the pure ginseng provided only a slight improvement in fatigue symptoms. However, at eight weeks, ginseng offered cancer patients significant improvement in general exhaustion — feelings of being "pooped," "worn out," "fatigued," "sluggish," "run-down," or "tired" — compared to the placebo group. "After eight weeks, we saw a 20-point improvement in fatigue in cancer patients, measured on a 100-point, standardized fatigue scale," Dr. Barton says. The herb had no apparent side effects, she says. Ginseng has long been used in traditional Chinese medicine as a natural energy booster. Until this study, its effects had not been tested extensively against the debilitating fatigue that occurs in up to 90 percent of cancer patients. Fatigue in cancer patients has been linked to an increase in the immune system's inflammatory cytokines as well as poorly regulated levels of the stress-hormone cortisol. Ginseng's active ingredients, called ginsenosides, have been shown in animal studies to reduce cytokines related to inflammation and help regulate cortisol levels. Dr. Barton's next study will look closely at ginseng's effects on the specific biomarkers for fatigue. "Cancer is a prolonged chronic stress experience and the effects can last 10 years beyond diagnosis and treatment," she says. "If we can help the body be better modulated throughout treatment with the use of ginseng, we may be able to prevent severe long-term fatigue."